Early men's dormitory room at Hesston College - 1910s? “Early Dormitory Room,” Hesston Public Library, accessed April 25, 2019, https://hesston.digitalsckls.info/item/1646. 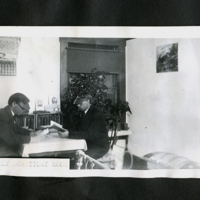 Two men studying, labeled "early dormitory room" at Hesston College - likely 1910s?